Credit : Photography by Limner, courtesy of The Sunday Painter and the artists. Credit : Photography by Limner, courtesy of The Sunday Painter and the artist. 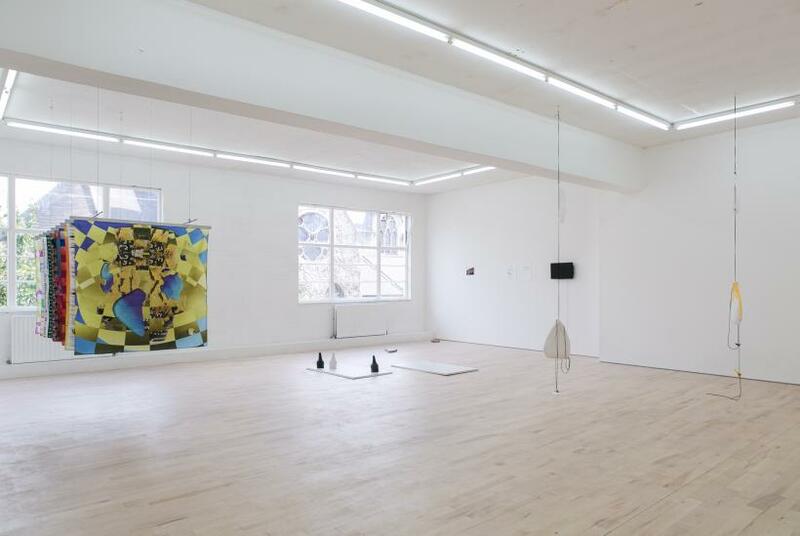 The title of the group exhibition at The Sunday Painter ‘The Spirit of the Staircase’ derives from a French term conjured up by eighteenth-century art critic Denis Diderot to describe the occasion when a person is left speechless upon hearing something, and only later thinks of a response. In the modern sense it describes the predicament for thinking of the perfect retort too late. It is a little used and archaic term that has been utilised as a framework to consider the reinterpretation of ideas and cultural artefacts as they evolve over time. 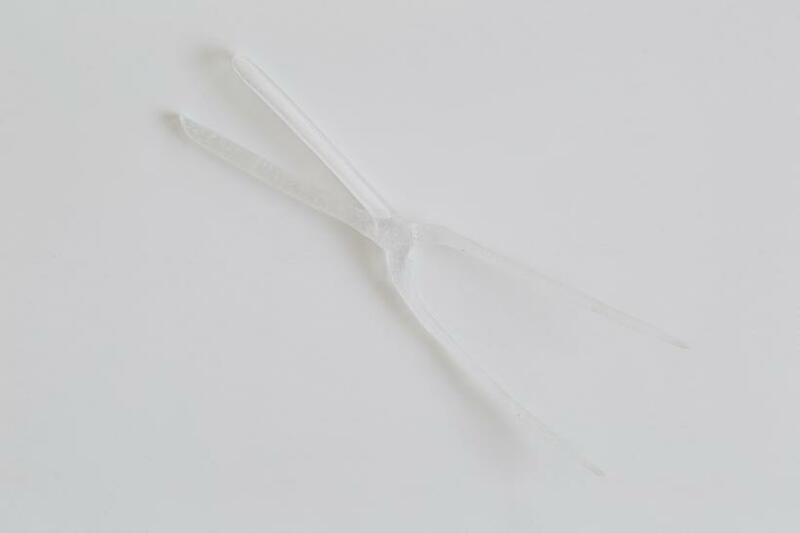 Within the context of the title, the works operate as mnemonic tools or artefacts and the viewer is left to extricate the meaning or origin of these memories. 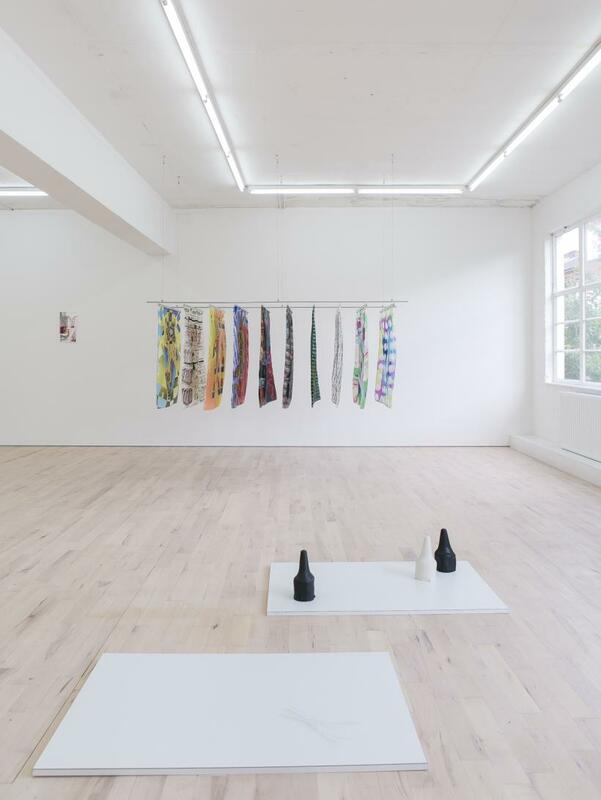 Curated by Elinor Morgan, the exhibition features twelve works by seven artists. The pieces range in medium from film, works on paper, concrete and silkscreen print. 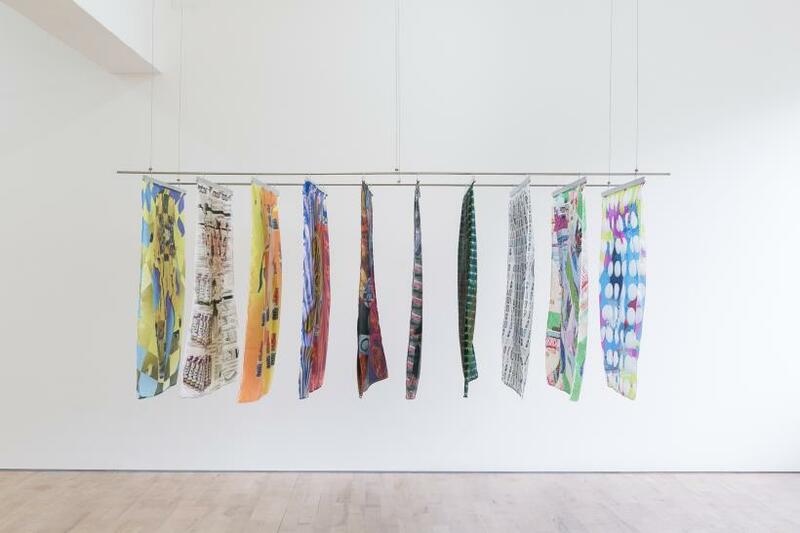 All of the works were produced in 2014 or 2015 and are displayed on various horizontal planes, whether hung on the wall, suspended from the ceiling or installed directly on the gallery floor, which has a jarring effect in disentangling the works from each other visually. In the accompanying exhibition guide, the show has been split into different themes: symbols, logos and codes, the voice as text, memory and excavation and casting. Two works are left outside of the main exhibition space in the downstairs and upstairs corridors and introduce these ideas. 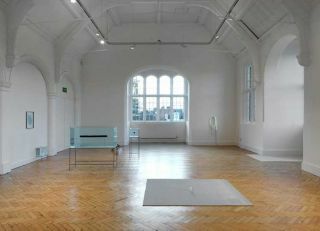 Sophie Mallett and Marie Toseland’s collaborative work ‘2s from the bottom up’ (2015) is an eleven minute audio piece of a woman speaking in the past tense beginning with the narrator recalls a woman drawing the number two from the bottom up. The work presents the idea of the hopeless task of memory recall that will be further explored within the body of the display. 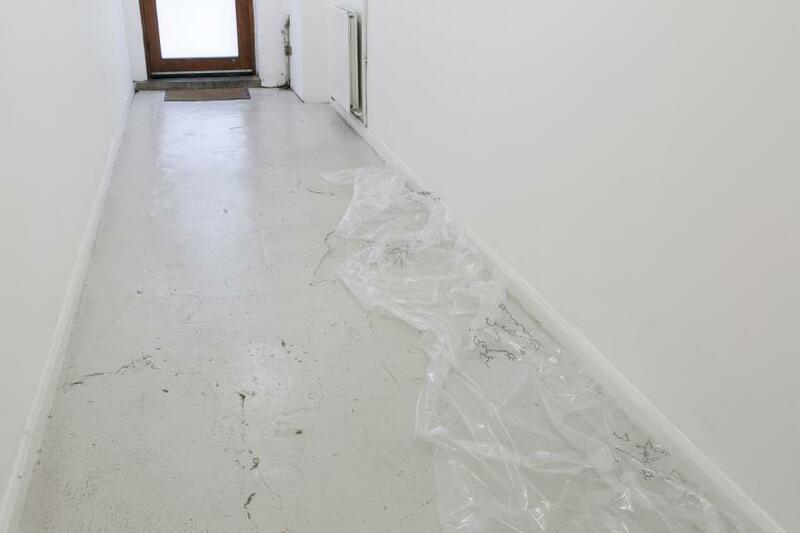 ‘Untitled (excess)’ (2015) by Andrew Gillespie is displayed directly on the floor of the downstairs corridor along the length of the wall: a long crumped sheet of clear silkscreen-printed polythene. Aesthetically the piece is a departure from Gillespie’s other works in the exhibition, which are colourful and fragmented. It looks like a piece of forgotten office detritus strewn on the floor, except that it has been screen-printed with minute drawings of clouds. 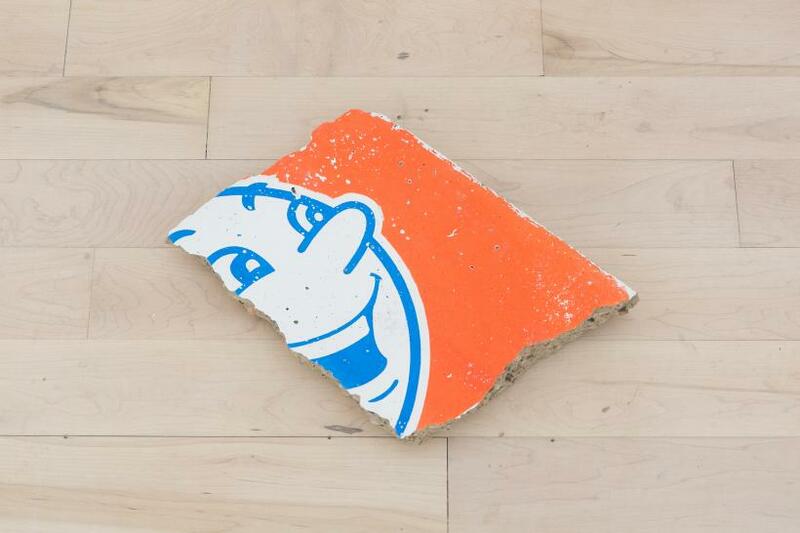 The three works from Gillespie in the main gallery space ‘Inspirational’ (2015), ‘mets’ (2015) and ‘I am the Resurrection’ (2015) are silkscreen prints on concrete that feature fragments of corporate logos. They are suggestive of broken relics from a forgotten time; a time travelling archaeologist resurrecting ruins from our age. 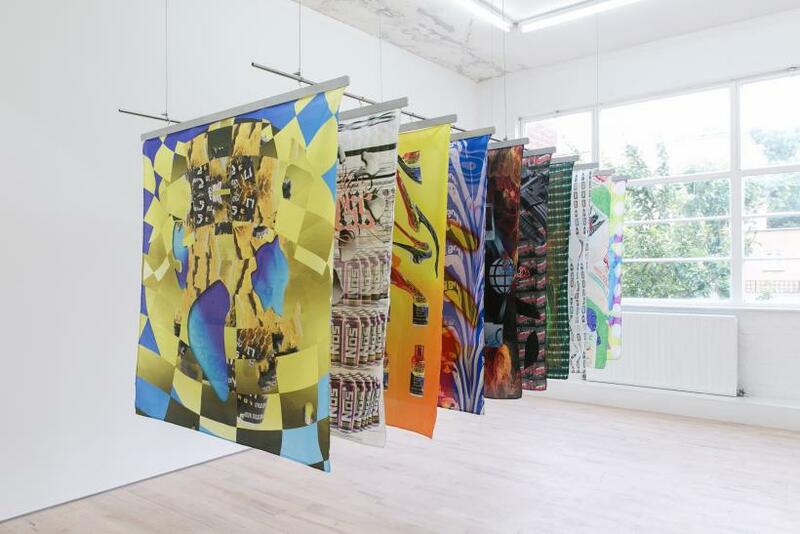 Similarly, Danilo Correale’s piece ‘Boosted’ (2014), ten colourful screen-printed silk squares that hang in linear formation from the ceiling, explores at advertising and brand identities found in the energy drink market. ‘Do not feel to guilty about all of this because you only reported what you saw, and what you saw was only 150 meters on either side of the Holiday Inn’ (2015) is a film piece as well as two pen ink drawings on paper and a photograph by Beth Collar. 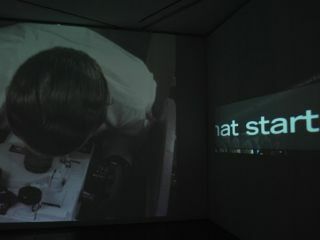 The work relates to the 2014 performance where the artist read a transcript of a televised interview where Borislaw Herak, a Bosnian Serb soldier and alleged war criminal, admits to a number of horrific crimes but was later discovered to have been under duress, with suggestions that parts of the responses were scripted. Collar’s work in this exhibition captures journalists’ responses to the Sarajevo Siege, which exposes the danger in media coverage in the omission and inclusion of particular facts. Within the framework of ‘The Spirit of the Staircase’ it blurs the distinctions between fact and fiction, and history and mythology, suggesting the impossible pursuit of perfect recall and the questionable reliability of archival material. Marie Toseland’s works in the main exhibition space ‘FP’ (2015) and ‘MI’ (2015) are small casts of objects which have been made from glass and black and white porcelain. 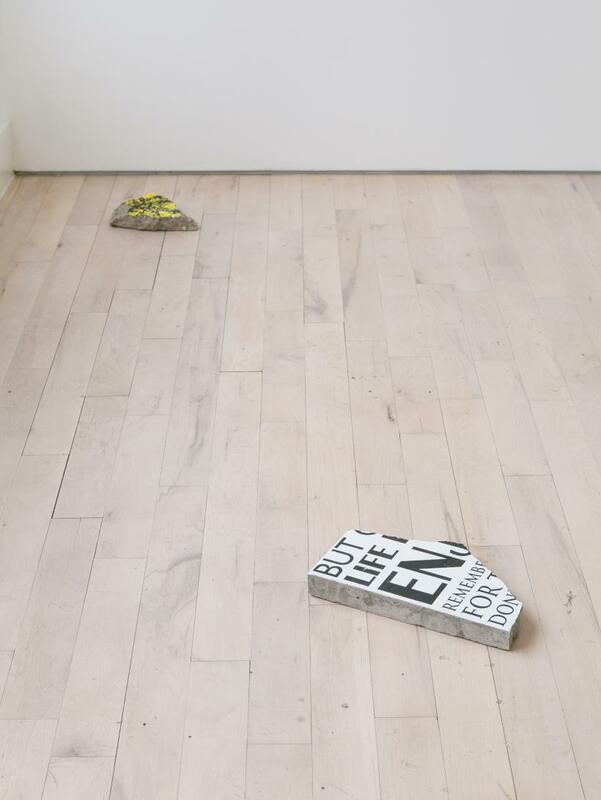 Displayed on the floor, the casts sit heavily on their low platform and embody the inability to truly represent the original. Vessels of failed imitation, Toseland’s casts reference a visual language of falsehoods. 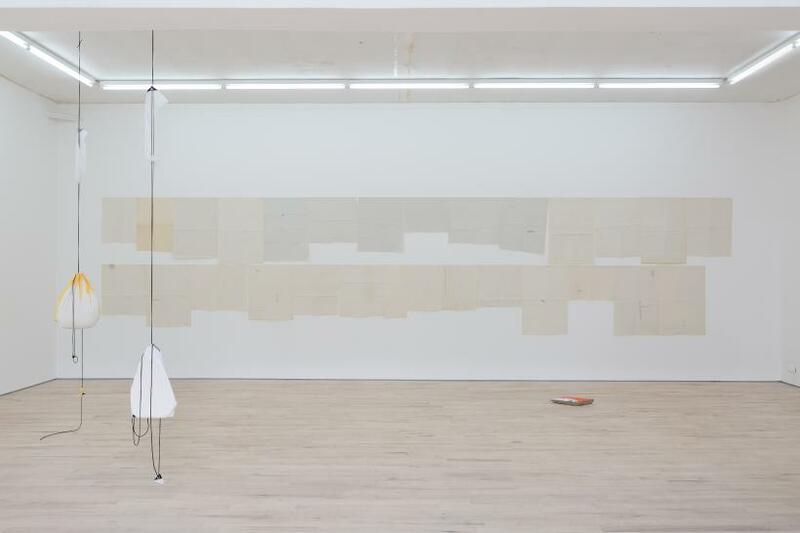 Occupying a large wall on its own is ‘The view from the long couch’ (2015) by Sue Tompkins, twenty-nine different sized sheets of paper with text, displayed in two horizontal lines. 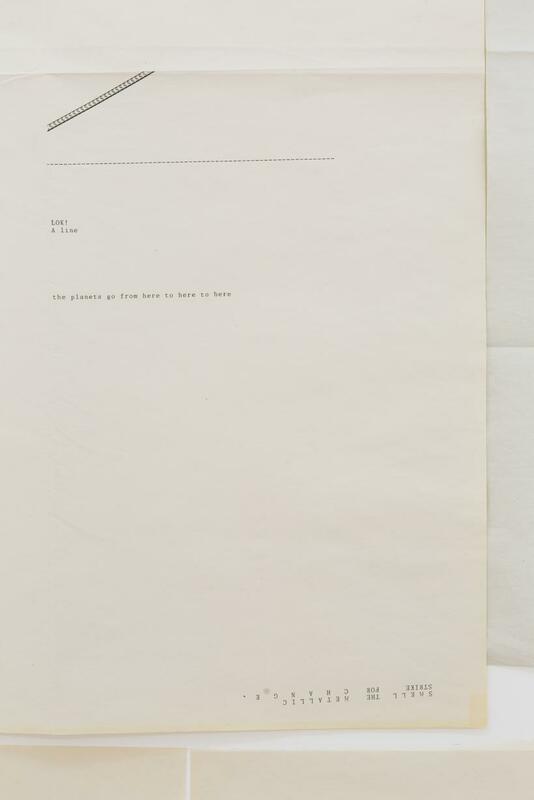 The sheets of paper are dotted with words that have been made on a typewriter. It isn’t clear what the words are, where they have come from, what they refer to or how they relate to each other and in some occasions the typewriter is used to create visual patterns and code-like designs awaiting decoding. Hindsight is a pivotal starting point for understanding the display. The works reference something, an event or object, that precedes the work itself whether it is a fragmented logo, a cast, or a narrative spoken in the past tense. 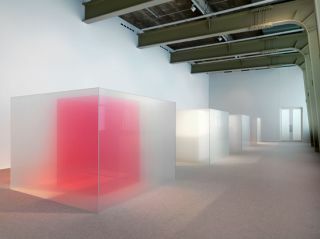 Interestingly, any form of review of this exhibition participates in the very phenomenon that the exhibition refers to where memory, subject and object are indistinguishable from each other. 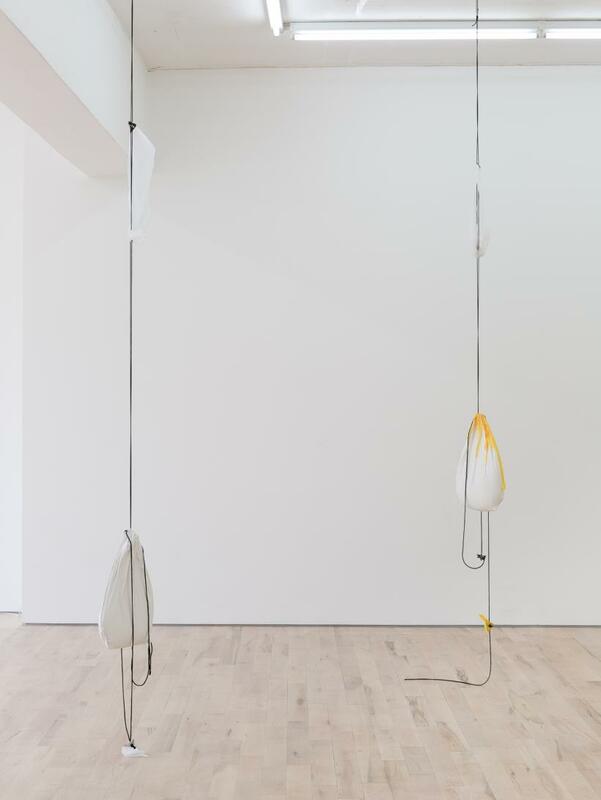 The exhibition title and the works included are suggestive of recollection and reframing, uncovering how time and memory affect the nature and essence of the objects that they make reference to.